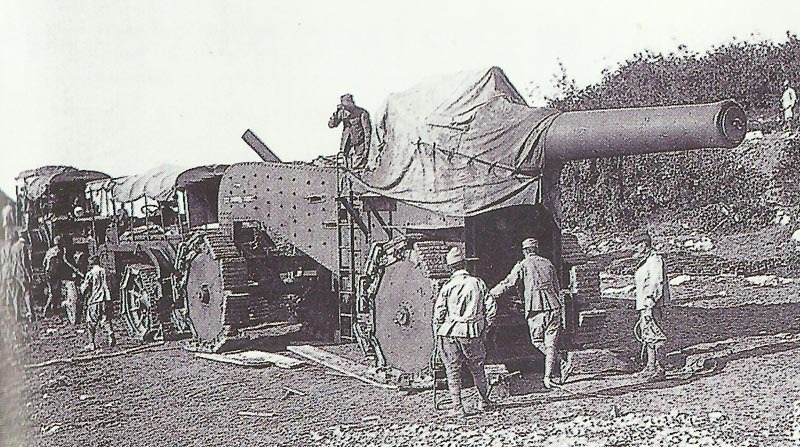 Soldiers during the further transport of an Italian heavy howitzer. Isonzo: Italian Third Army has pushed Austrians up slopes south of Mt San Michele (900 ft) and gained bridgehead for assault on Carso Plateau. Serbia: Serbs capture Danube island of Michaiska. Mesopotamia: Gorringe’s c.3,000 men and 4 Royal Navy gunboats anchor in Euphrates 45 miles west of Ourna for advance on Nasiriya as ordered by India (June 21) but vetoed by Whitehall (June 14). Cameroons: British take German Fort Koncha. Baltic: Russian battlecruiser Izmail launched at Petrograd, first of four, never completed. Aegean: ­Destroyer HMS Hussar shells Asia Minor coast opposite Chios. Adriatic: UC12 first German U-boat of Pola half­-flotilla based at Cattaro. Germany: French pilot Gilbert tries to bomb Zeppelin works at Friedrichshafen, but is interned on landing in Switzerland (escapes 1916).